30 years or so ago, your correspondent’s father-in-law dragged him along to a cocktail party in D.C. at which we encountered Bill McGowan, the then-Chairman of MCI, the alternative long-distance company that prospered as ATT’s monopoly hold on the market eroded, then evaporated. As another gentleman joined our little group, McGowan smiled archly and said, “ah, here’s my head of R&D”… then introduced us to his General Counsel. Of course, business strategies that turn on challenging regulatory regimes, or practicing regulatory arbitrage, date back much further than MCI. Indeed, Theodore’s Vail Bargain (creating the Bell System monopoly) in the early 20th century created the status quo that McGowan (and others) later attacked. More often than not, emerging technology has enabled (if not, indeed, driven) these regulation-challenging new entrants. So it’s no surprise that we find the marketplace today positively rife with them. Further to the notion that “the Internet might provide profitable opportunities at the edges of the legal system.” see also “Strategic Law Avoidance Using the Internet: A Short History” (pdf) by Tim Wu of Columbia Law School. As we’re careful for what we ask, we might send mannerly birthday greetings to Baldassare Castiglione; he was born on this date in 1478. 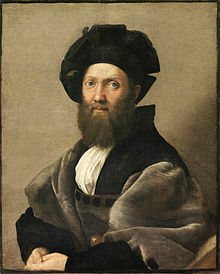 A Renaissance soldier, diplomat, and author, he is most famous for The Book of the Courtier.– a prime example of the courtesy book, offering advice on and dealing with questions of the etiquette and morality of the courtier– which was enormously influential in 16th century European court circles.